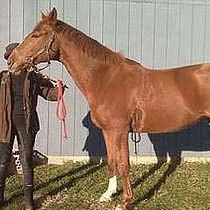 Lady Ada is owned by one of President Obama’s aides in the White House. They were referred to us to find out what happened to her. Arriving at the beautiful horse farm in Damascus, something seemed really weird. This huge horse magically disappeared overnight, while being held in an outside corral. There were reports of strange scuffing sounds around the stables that night. The door to the corral was off its hinges. Lady Ada was MIA. When DFD arrived with Heidi the K9 they were not told immediately who this horse belonged to. It came to light later on. Heidi was scented up where the horse was being kept outside and off she went down the grassy side of the long half mile driveway. This was strange. Why would the horse choose to walk only on the grass? Then as the driveway made a turn the scent moved to the center of the pavement. And very, very abruptly Heidi alerts to the end of the track and sits right in the middle of the driveway. How in the world can this be!!! Then, when looking down at the ground long hoof marks were scraped into the pavement. The stable owners said that horses do that when they don’t want to go into a trailer and that there has been no other horses at this area. It was Lady Ada’s marks! The rest of the property was scanned heavily for this horse. Auctions were scoured to see if she would appear for sale. With the hinges so perfectly removed from the corral and the findings of the search dog it helped to confirm the theft. It is not known why she was stolen. Only that whoever did it had to have had some inside information.